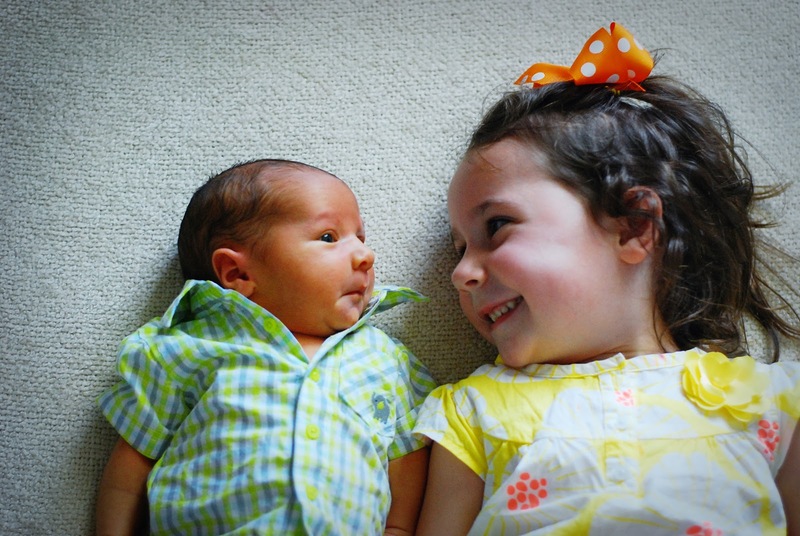 A week ago today- little Nolan joined our family. This week has been a blur. A good blur. But a blur. And I have a post started with just a compilation of pictures I've taken since we've been home, but to sit down and write out all I want to write would take a little more time than I have today. But I do have a few pictures from today that I want to post before I get too far behind. We had a little check-up with the pediatrician this morning. At discharge- the doctor told us that if we thought he was doing fine with everything we could cancel this appointment and just come at the 2 week check-up...but I feel like he's still pretty jaundice and just decided to go ahead and keep his appointment just for my own sanity. Before we weighed him- Geoff changed his diaper. And unfortunately- Geoff wasn't quick enough and Nolan sprayed pee everywhere. And this is what he thought of that. Parker was in school so we just had this gal with us and she was in the best mood and kept us laughing. He did well at his visit. His bilirubin level was higher since discharge, but still well below the "low-risk" area on the bilirubin chart. So we are not concerned for now- but by next week we would like to see that level go down or we'll end up having a blood test to check his level and try to find out the cause of his jaundice and blablabla. I'll get into all of that more later if it ends up being an issue. He also weighed in at 8lbs, 2oz.... only gaining 1 ounce since discharge. And while the pediatrician is not concerned at this point... our goal is for him to gain an ounce a day between now and next week. We'll see! So while he's healthy and such- there a few things that need to happen over the next week. I'm so glad we ended up keeping this appointment just as a baseline for us to know where we're at. When we got home- I wanted to take a few pictures in his 'outfit'. He's pretty much been in a sleeper since birth...and since we were getting out today I wanted to dress him up a little. Sister wanted in on a picture too and this picture has turned out to be one of my all-time favorites. We have the return of the growth chair pictures!! I did this with Grace and love how it turned out. 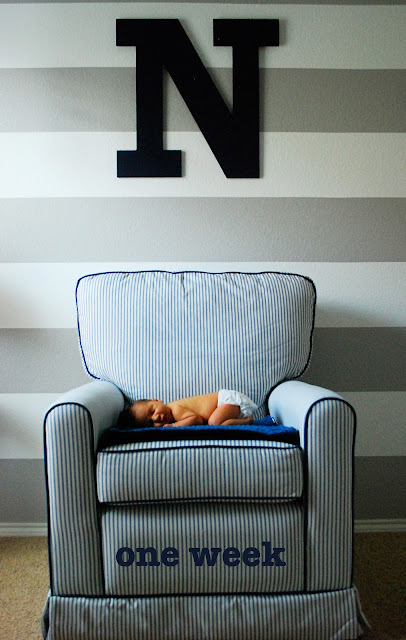 I know this is the chair we will use with Nolan...but not sure if we will keep the N in the picture or not? What do you think? We may try to retake them tomorrow. He sure does look like a little man! He was looking at Grace like he already knew her so well! So very precious! Greg and I both melted when we saw the picture of Grace and Nolan! So glad you guys are doing well! Can't wait to see you all this weekend!